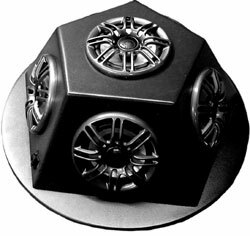 A review of the history of Isobel Audio’s Hemisphere loudspeakers, from their humble beginnings to today. 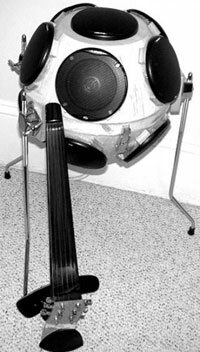 The first speakers were developed as a part of Perry Cook and Dan Trueman’s N-Body project at Princeton University, which studied the emanation of sound in different directions from a variety of musical instruments. The first working models included the full-sphere Bomb and the Boulder. 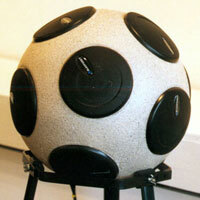 A slightly later version of a performance rig included R2, a spherical speaker built from Ikea salad bowls. 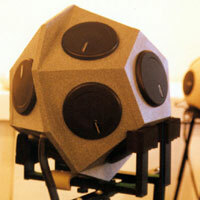 After several permutations, the first generation of performance-ready spherical speakers was built. 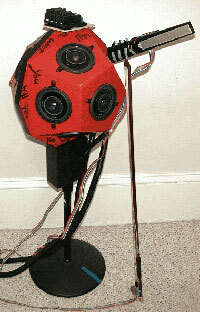 A dodecahedron (12-sided) cabinet was designed by Dr. T. Laurence Trueman and Dan Trueman, and several instruments were developed from it, including Dan Trueman’s critter speaker, and Curtis Bahn’s large Bubba speaker. 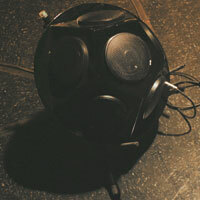 These were integrated into Trueman’s Bowed Sensor-Speaker Array (BoSSA) and Bahn’s Sensor Bass R!g, respectively. The second generation of spheres, developed by Trueman and Bahn, featured truly spherical cabinets designed and fabricated by Universal Enclosures. While this design solved many problems of construction, it proved to be problematic in other ways, such as the difficulty of mounting speakers tightly to a curved surface. 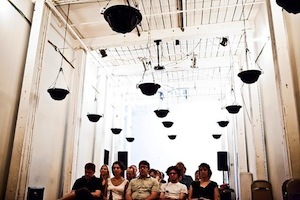 Returning to the Trueman design for inspiration, hemispherical speakers were developed which could be fastened together into a sphere or used as separates. 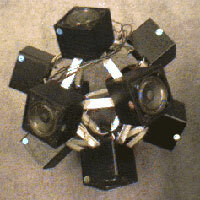 A major project was undertaken at Rensselaer Polytechnic Institute by Professor Curtis Bahn, assisted by graduate student Stephan Moore to build a large quantity of these speakers. Not only are these speakers the first actual Hemispheres, they are also the first to use Polk Audio drivers, a relationship that continues through today. The cabinets are build from MDF and painted with glossy black enamel at an auto body shop. In all, fifty-five third generation Hemispheres are built in the first eight months of the year. The fourth generation of Hemisphere develops a cult following, with a small but growing cadre of musicians, artists, and composers using Hemispheres in their performances and installations. Stephan Moore begins manufacturing new hemispherical speakers, and master furniture maker Ken Malz is enlisted to build the speaker cabinets. Malz and Moore make several incremental improvements to the design, including larger high-quality Polk Audio speaker drivers, rounded edges, and a durable powder coating finish. The new Princeton Laptop Orchestra, or PLOrk, is formed by Dan Trueman, Perry Cook, Ge Wang and Scott Smallwood. For their performer’s setup rigs, they develop a modification to the 4th Generation Hemisphere that allows the individual speakers of the Hemisphere to be addressed independently, turning each speaker into its own six-channel speaker array. 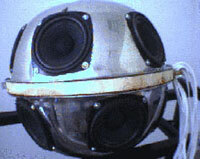 Moore incorporates the Princeton design and begins building both mono and six-channel Hemispheres. Moore begins an important partnership with Electrotap, an online company run by Jesse Allison and Timothy Place, makers of the Teabox sensor interface, Tap.Tools extensions for Max/MSP, and other hardware and software products. Through this internet retail outlet, Hemispheres begin to reach a much wider audience, bringing the revolution to the people! Sales of Hemispheres through Electrotap continue, and some further design modifications are made, including the introduction of handles in the base flange and an update to the Polk speaker model. 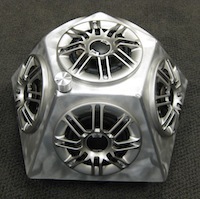 Meanwhile, the Princeton Laptop Orchestra receives a large grant from the MacArthur Foundation, and uses it to develop a unique variation on the Hemisphere design, flangeless and made entirely of brushed aluminum. These Hemispheres also contain their own internal amplifiers, making them the first self-powered Hemispheres. 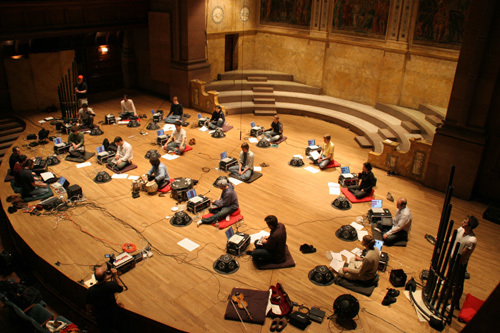 With a six-channel audio interface mounted on the bottom, they are highly portable all-in-one voiceboxes for the laptop musicians. Hemisphere production slows and then goes on a hiatus while Stephan Moore moves to Pawtucket, RI and begins to research affordable amplifier technologies to install in a new generation of powered Hemispheres. Inspired by a commission from Irish composer Alex Dowling, the project eventually takes 18 months, working in conjunction with the China-based company Helder Hifi. 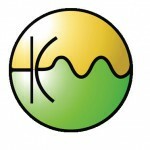 Finally, in April 2012, the Hemispheres are back! We’ve launched a new company, Isobel Audio LLC, and unveiled the new Alto and Baritone models of the Hemisphere at the first Symposium for Laptop Ensembles and Orchestras (SLEO) at Louisiana State University. 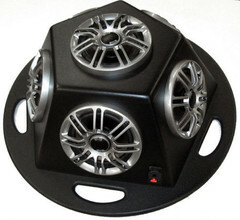 Each of new sixth generation of Hemispheres operate as both mono and six-channel loudspeakers. The Alto and Baritone are available in powered and passive versions. Isobel has plans! Working with the amazing team of friends and associates we have assembled over the past decade, we hope to soon offer custom-built instrument cases for the Hemispheres, battery packs that will allow our powered Hemispheres to operate away from power sources, and upgrade kits that will allow your older Hemisphere speakers to be retrofitted with amplifiers to become self-powered. We’re also looking farther down the road to develop speakers with built-in audio interfaces, wireless speakers that receive audio via Bluetooth, and self-aware systems of speakers that can communicate with each other, and are capable of integrating with web and sensor technologies in ways that you will help us to imagine. Stay tuned! The most interesting part of this history is not yet written.